Road to recovery: Amy Kennedy with her mum Zoe Matters at home, where she has been bed-bound for three years. Picture: StEVE TAYLOR. A DELIGHTED South Yorkshire girl has been out with her pals for the first time in three years as she begins the long road to recovery from a rare illness. Amy Kennedy, of Doncaster, has been bed-bound since she was struck with a condition called complex regional pain syndrome. But after undergoing pioneering medical treatment in America, Amy has now improved enough to enjoy her first evening out to a restaurant with friends, and spent two hours at the weekend in a town centre restaurant on High Street, to celebrate her 15th birthday, which is today. And the following day she made her first visit to a friend’s house for three years, staying overnight. She has been back in England for two months after a three-week course of treatment and still suffers pain through her condition – but it has been reduced to the point she is finally able to get out of bed and move about her home on Adlard Road in a wheelchair. Amy said: “It is something most of my friends do all the time – but going out for the first time in three years meant the world to me. It feels as though my treatment has changed my life. After three years of being bed-bound, I have now had the best weekend ever. The syndrome, which affects 11,500 people in the UK, left Amy with a chronic burning pain in her limbs, unable to take any pressure on her legs. The disorder is so rare the specialist treatment she has undergone is available only in America. Her treatment in the US involved the application of an electrical current to pads placed on her body. She has continued with the treatment with a machine she has brought back from America. Her mum, Zoe Matters, said she had finally been able to get out with pals for a meal at a restaurant. “It is going really, really well. She can now touch the top of her leg, which she could not before the treatment started because it was too painful. “She can now get into a wheelchair and we can take her into other rooms. She is still in pain, but it is tolerable for her now. She can get out of bed and do a couple of hours in a wheelchair. “It is the first time she has been out socially for three years. She has only been out for hospital visits over that time. Amy had her evening out with eight pals, plus her mum and grandmother. Earlier the same day, she met injured Doncaster paratrooper Ben Parkinson, who told her about his battle to walk again after his was wounded. Zoe hopes Ben’s story will be an inspiration to her. The family are now hoping to get their home modified so they can use a wider wheelchair with larger wheels, which would allow Amy to move it herself by pushing the wheels with her hands. They have been in touch with Doncaster Council over the work, but have been told there is a waiting list. Her doctor in America has told her she may be able to walk on crutches in three years’ time. The family raised more than £50,000 from a series of community events to give Amy the chance of specialist treatment. She first complained of knee pain at around the age of seven but was not diagnosed despite MRI scans and numerous X-rays. Her condition got gradually worse after she fell awkwardly during a dance class. Click here to read the original post online. Retired Air Force Veteran Jonathan Haag has walked down a path of pain for years, all stemming from foot surgery back in 1994. The surgery was supposed to correct his osteoarthritis, which was caused by the steel-toed boots he wore as an Airman. Instead, the surgery sparked something called Reflex Sympathetic Dystrophy, or RSD. Doctor Julianne Flynn, the Chief of Staff at the South Texas Veterans Health Care System, said the disorder can be triggered anytime there’s trauma to the body. In Jonathan’s case, his foot surgery. Flynn said each patient exhibits different symptoms, but in Haag’s case, the RSD caused his legs to grow out of control. That severe pain meant Haag had to do something drastic. He opted for a radical procedure called a Ketamine Coma, which would place him in a coma for six days while injecting him with the drug Ketamine. The procedure is considered so risky, it’s not approved by the U.S. Food and Drug Administration, and rarely performed in the United States. Because Jonathan’s condition was considered so bad, he was not a candidate for travel outside of the U.S.
One year after the treatment, Haag’s legs are improving. He’s able to walk around, though still uses the help of a wheelchair. Haag said he’s focusing now a new path of faith, family, and forgetting the pain. 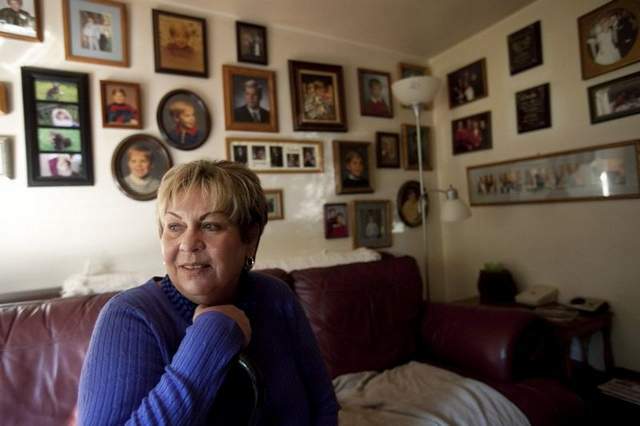 Anne VanCuren, 59, traces the onset of her reflex sympathetic dystrophy to a 2006 fall. It took four years for her to be correctly diagnosed. The condition is so bad that she is unable to work as a nurse. The flipflops on Anne VanCuren’s feet last week had nothing to do with the recent run of warm temperatures. VanCuren, 59, of Pike Creek, wears the slip-on shoes year-round because any other footwear is too painful for her swollen, aching feet. It’s just one of the small ways her life has changed since VanCuren developed reflex sympathetic dystrophy, or RSD, after a fall in 2006. Also known as complex regional pain syndrome, RSD is a chronic pain condition that results from a malfunction of the nervous system. Those who live with the progressive disorder endure severe, burning pain in parts of their bodies, usually their extremities. What’s worse, their pain can be exacerbated by the weather. Something as simple as feeling a rush of cool air from outside can turn their skin spotty shades of purple and red, while simultaneously giving them the sensation of being being poked all over by a sharp skewer. Even in mild weather, VanCuren covers herself with a blanket when her husband, Wayne, opens the door to let their dogs out. Moving around is painful so she uses a cane; areas of her knee are so sensitive even parts of her jeans can’t touch them. She spends most of her days in the couple’s lower-level den, rarely venturing out of the house alone and never when it’s cold. RSD usually develops following an accident, injury, surgery or other trauma. In children, the culprit often is a sports injury or fracture, but adults can develop the syndrome following surgery, such as for knee replacement or carpal tunnel syndrome. Rather than healing over time, the trauma instead causes the sympathetic nervous system — responsible for the body’s fight-or-flight response — to respond in an abnormal way. For people with RSD, this can include intense pain, skin sensitivity, swelling of their tissues, tremors or other movement problems. More than 1 million people are estimated to have RSD, with about 50,000 people in the United States are diagnosed each year, said James Broatch, executive director of the Reflex Sympathetic Dystrophy Syndrome Association, based in Milford, Conn. The impact of living in such intense pain tends to be underestimated. Broatch said survey of RSD patients done by researchers at Johns Hopkins University found that 47 percent of patients reported they had considered suicide. Cold weather often is a trigger for a flare-up, but some people also are affected by heat. Because there are no medical tests for RSD, patients may have to endure pain for years, seeing an average of five doctors before they get an accurate diagnosis. Broatch said one of the challenges facing patients is the subjective nature of pain, which can be hard to measure. Physicians also typically aren’t trained in how to treat patients with chronic pain, and some may view their patient’s discomfort as psychological rather than physical. Even after working as a licensed practical nurse for 35 years, VanCuren had never heard of RSD. Apparently, neither had most of the dozen physicians she saw in the years following her fall. She underwent knee surgeries to repair torn meniscus and remove a cyst, while another doctor told her she needed a total knee replacement. All the while, both of her knees continued to swell and take on a purplish hue. Eventually, the pain made it too hard to continue working, and VanCuren went out on disability. Depression settled in — a common occurrence for those battling RSD — and she continued to seek out a health care professional who could figure out what was wrong. Even after she was diagnosed two years ago, sustained relief was hard to find. But earlier this year, VanCuren spent five days at Hahnemann University Hospital in Philadelphia, where she underwent five days of treatment with intravenous lidocaine, a local anesthetic that stops nerves from sending pain signals. The treatment reduced her pain as well as her depression symptoms. Six months later, the effects have faded. Doctors have recommended another infusion, but her insurance won’t cover the $42,000 cost. As she looks at other options, she takes nine kinds of medicines, including anti-depressants and pain medication. None are narcotics because she has a sensitivity to them. Pain modification is key for people with RSD, Broatch said. Medications can help, but physical or occupational therapy can make a difference, although in some cases the therapy can cause more pain before it eventually decreases. Sleep also is critical. Autumn Stevens, 32, of Harrington, has lived with RSD after a rollover vehicle accident when she was 21. It took her five years to get a diagnosis. On occasion, she’s had to go to the hospital because the pain is so intense, yet she’s faced skepticism from medical personnel who don’t know about her condition and don’t realize her sensitivity to being touched. “I’ve had doctors think I was faking. You’re treated as a drug-seeker,” said Stevens, who takes a low dose of narcotics. Click here to read the original article online.